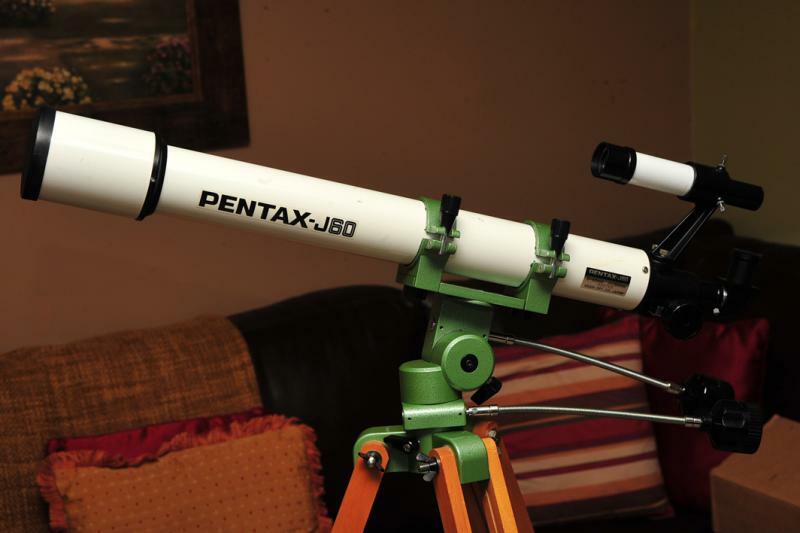 I have recently become infatuated with Pentax telescopes after doing some research on them. To me, they seem nearly the quality of Takahashi and made in Japan. 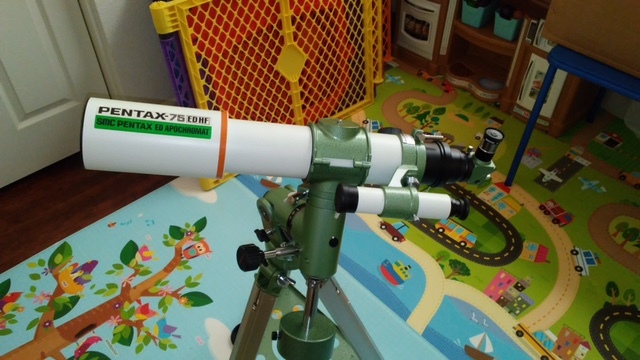 Unfortunately Pentax stop making telescopes in 2008. Also it seems not many were imported here to the U.S. 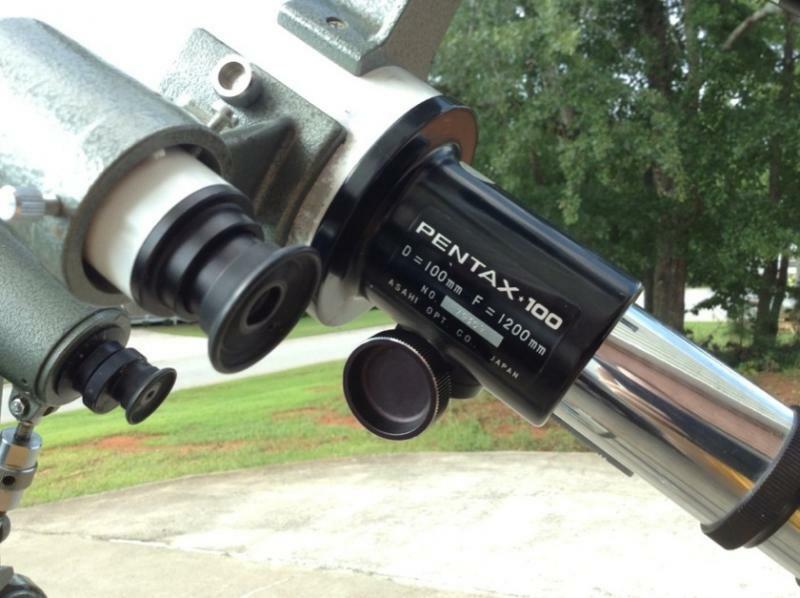 There is some information here on CN for Pentax telescopes, but not so much mounts. 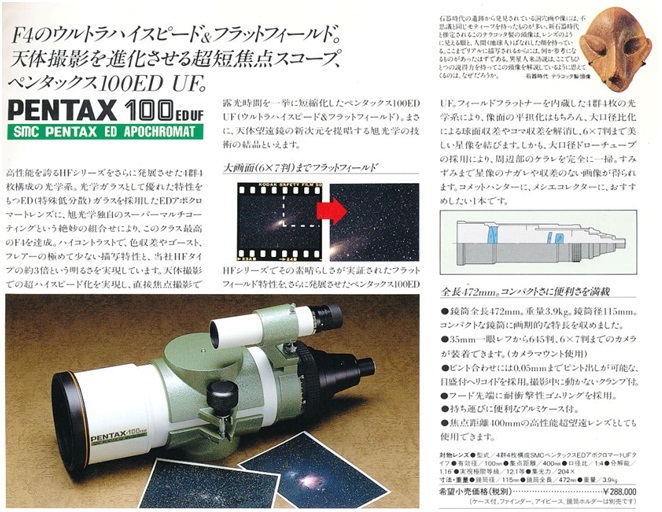 It has a brief history on Pentax telescopes with great pictures, you will want to use Google Translate to read through it all but it is absolutely fascinating to me. 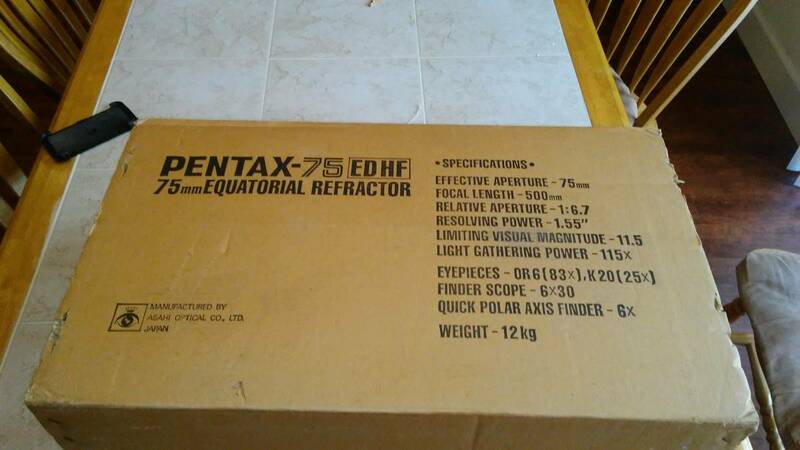 Anyone have any experience with Pentax equatorial mounts? I have heard of the MS-2, MS-3, MS-4, and MS-5 mounts but haven't really seen any specifications on them. 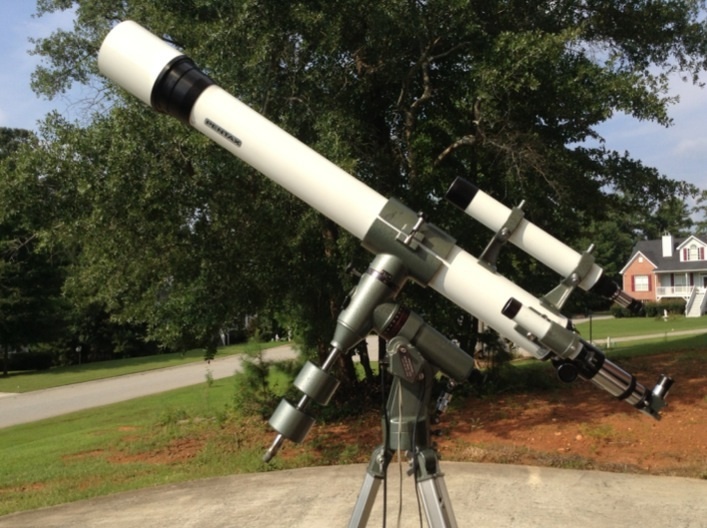 It would be really cool to have people post pictures and any pertinent information here on their Pentax telescopes and mounts. Thanks! I have the 100, and the 70, and used to have the 85 that are shown in the black and white leaflet. Have the pier mount for the 100 as well as the extruded aluminum legs. Will get some pictures out here of the 100. It is pretty impressiven and performance is first rate. Edited by Stew44, 22 August 2017 - 09:30 PM. I've had a few Pentax scopes and one mount. A 75SDHF a 105SDHF and a couple of older achromats, a Pentax 100 and Pentax 85 which share the same mount. 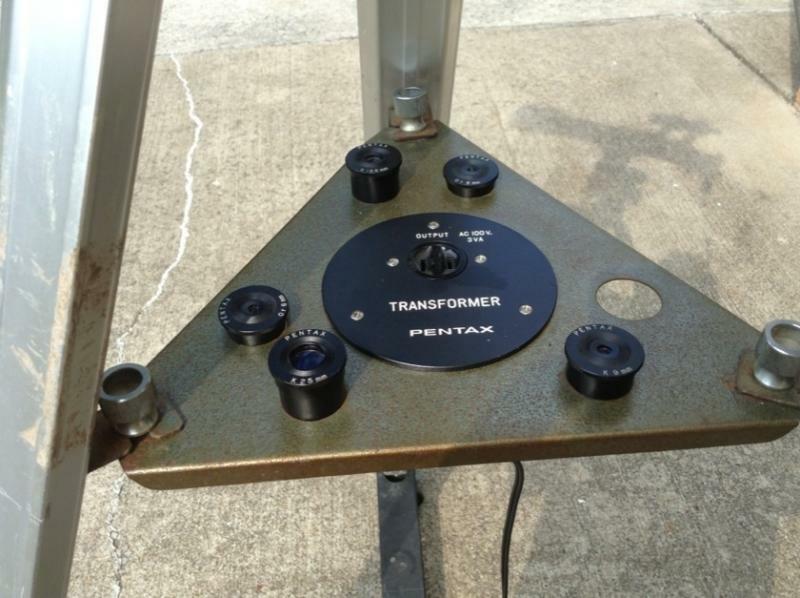 The SDHF models are mainly for deep space imaging and are superb for that but they're not high power planetary scopes. A Takahashi FS102 and Vixen 102FL will easily outperform the 105SDHF for that. Build quality is as good or better than Takahashi. Here's the 75SDHF. Below is the configuration of both versions. Edited by rolo, 22 August 2017 - 10:42 PM. Also had a Pentax J60 that was very nice, the mount is one of the best alt az mounts I've used. Worm and gear on both axis. Here's my 100 achromat on pier. 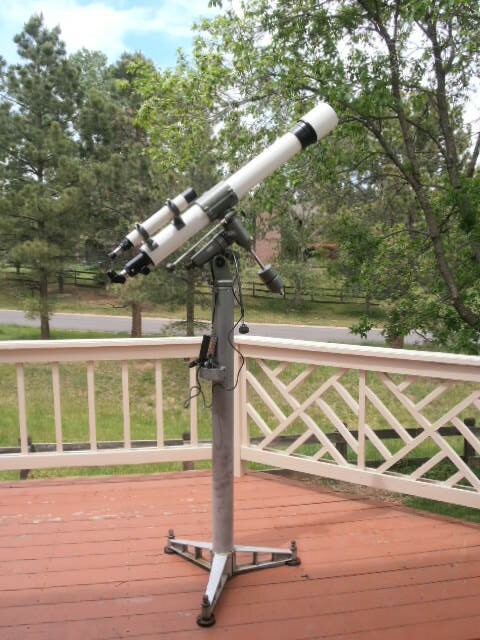 Mount wonderfully stable; telescope, best achromat performance I have seen in a 4", and at f/12 as well (so good on color I thought ED for quite some time, but now accept that it's only an achromat). How can one not be drooling over what is present at this place! Thanks for sharing this again. I recently looked at the objective of my J60 under double-pass autocollimation, using a 133LPI Ronchi grid. I was surprised to see that the lines were not as straight as the objective on my older Asahi Pentax 60mm objective, and even older Asahi Jupiter 60mm. Very surprised! I'm surprised how these Japanese classics have shown optical quality all over the place. Some are just plain dawgs! I believe you Tested a Zeiss 50/540 that didn't test very well. Just goes to show that you can't judge an entire brand based on a few DPAC results. I'm starting to believe it's on an per scope basis. Nor can you judge a brand based on reputation. I buy one Zeiss, it's not that great. Makes me a lot less likely to buy another Zeiss. At least Pentax is running at only 20% bad with me, not 100%. to focus, now it a museum in Spain, J 80 OTA, optics excellent, previous owner and following owner remarked on how good it was, someone is enjoying it here in the UK, 100 F12 Achro, I would have to agree with Rolo, this is about as good as it can get for a 4'' Achro, and I've looked through a good few, and the very rare 100 f12 ED Apo, I don't know if it's better than the NIkon f12, I was tempted to purchase a Nikon when one came up for sale in Europe for a comparison, but way to expensive for my pocket, so that comparison will have to wait ! I'd venture the Pentax 100 would beat that Nikon. Probably the best achromat 100 (at f/12 even) that I've used and folks I greatly respect thought it an ED refractor. Probably my favorite over a very nice Unitron that Johann now has, and even my Goto. I'd venture the Pentax 100 would beat that Nikon. Probably my favorite over a very nice Unitron that Johann now has, and even my Goto. Nice to see you again , i thing you don't open your account anymore. A few more pictures from the seller. Will write a full review when I get the scope in! I've never used a Pentax scope, but I knew a guy who shot with Pentax cameras and glass, and some of those lenses were really nice. 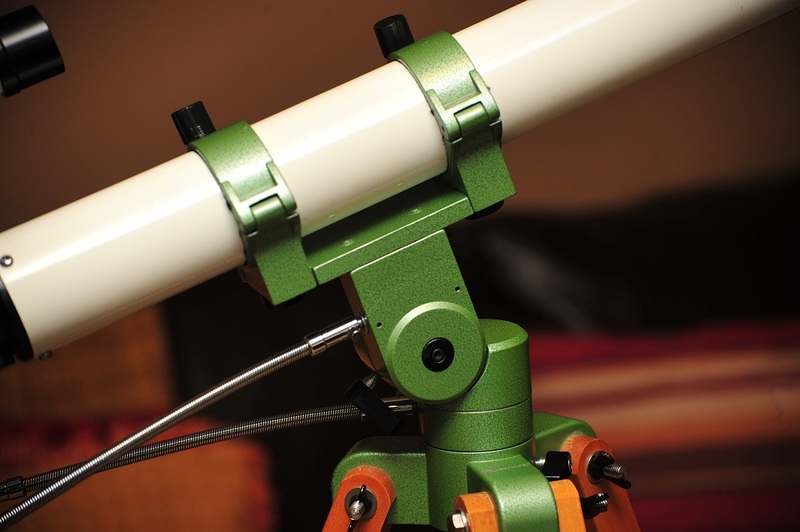 It would make sense that their scopes would be good. If I'm not wrong, I think Takahashi has their glass made by the same division that makes Canon camera lenses. So, they go hand in hand. The Pentax diagonal. 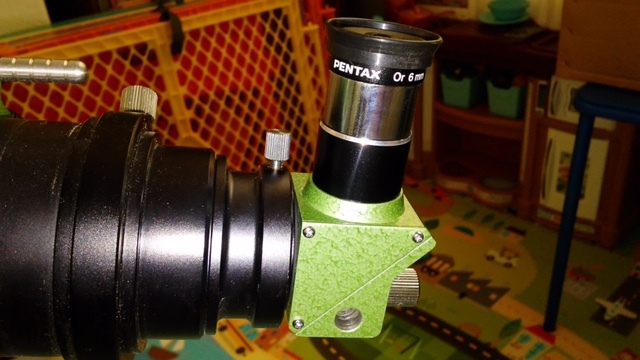 Unique to Pentax scopes as nose piece is not typical diameter. I was fortunate to get a Pentax 1.25 diagonal with my 4" and two Pentax 1.25" Barlows. 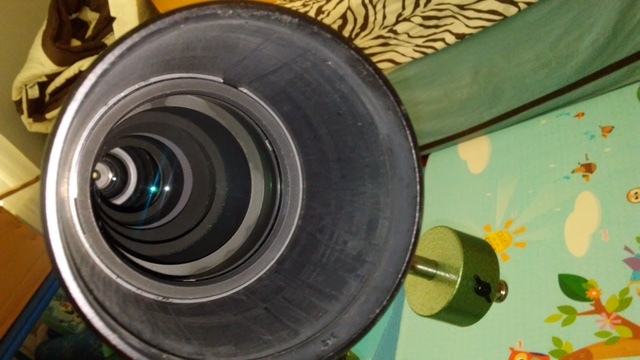 The hole underneath the prism is for the solar projection plate holder rod. Wow! That Pentax 75ED is gorgeous. 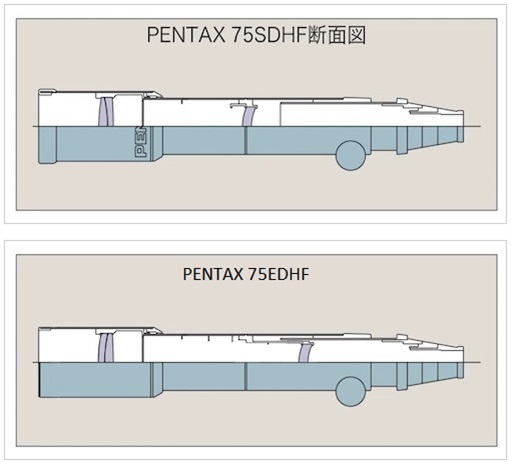 My brother has the Pentax 75mm ED and the 65mm ED; just the OTAs in the original Japanese packaging. Seems they were 18 to 20 years old? They were amazing when I looked through them. IIRC, the 65mm was longer/slower than the 75? So I haven't been on CN in well over a month, and when I decide to check back in there is a Pentax scopes thread at the top of the Classics page. Fate. I love vintage Pentax gear, though my "collection" is pretty modest. 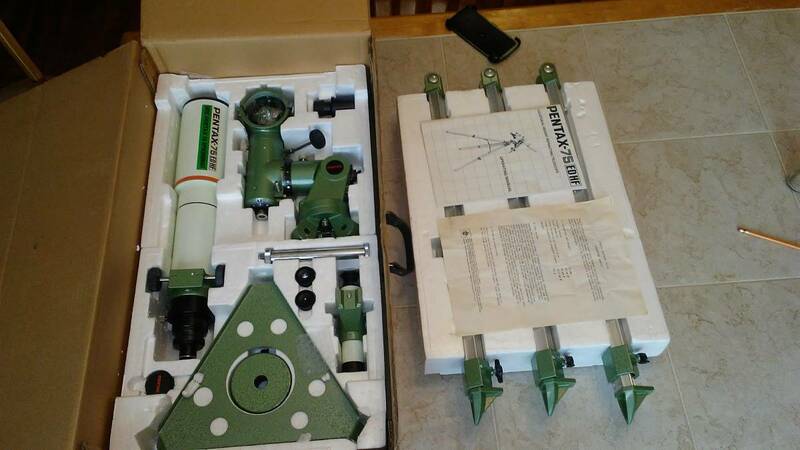 I have a 50mm Asahi (yoke) table top scope, a J60-c (short achro) and two J80s, with the second one (both scope and mount) making a strong argument for being parted out to help restore other J80's/J60's that may need some assistance. I also have a few representatives from the vintage ep sets that are probably my favourite eps. I had two of the older 60 mm x 800 mm Asahi Pentax refractors and really enjoyed them. 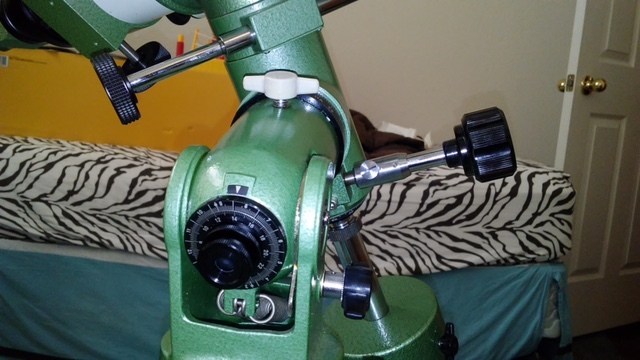 In part, this was because I had found two odd ball Burgess Optical diagonal eyepiece holders that fit the non standard visual back threading of the A-Ps visual back so I was able to use 1.25 inch eyepieces.. I briefly had a J60 but it had a 0.965" visual back and drawtube and I preferred the views of the older Asahi-Pentax..
What is the difference between Asahi-Pentax and Pentax, what the history there? Is this the one that was for sale in Sacramento?